Chamomile tea is more than a delicious-tasting, evening beverage. This natural herb in an aromatic tea also improves your health in ways such as reducing stress, alleviating an upset stomach or improving sleep. Plus, it is easy to prepare and you can enjoy it throughout the day. Chamomile is an herb and grows on two different plants: German chamomile (Matricaria recutita) and Roman or English chamomile (Chamaemelum nobile). Both plants deliver similar health benefits. German chamomile flowers resemble miniature daisies with white flowers surrounding a yellow cone. The flowers are typically less than one-inch wide. German chamomile grows naturally in Europe, Asia and North Africa and is the most popular form of the herb used for tea. What is Chamomile Good For? Used in tea form, chamomile improves sore throats, reduce stomach discomforts, calm anxieties and improve sleep. These qualities make it a wonderful before-bed beverage. Chamomile has also been used on babies. According to Parents Magazine, 1 to 2 ounces of this natural remedy is helpful for reducing colic. Always speak with your pediatrician before giving chamomile tea to your child and be sure to cool the tea to room temperature before your child drinks it. Chamomile tea has a flowery taste. It is made from daisy-like flowers, so those who are allergic to ragweed, asters and chrysanthemums should use caution when drinking the tea. If you notice a rash on yourself or your child, avoid chamomile tea and speak with your doctor. Chamomile tea is easy to make and is available in prepared form. You can also purchase the dried flower heads and crush them into your own tea. Place 2 to 3 teaspoons of chamomile in a tea bag, or tea ball. Pour 1 cup of boiling water over the herbs and let it steep for 10 to 15 minutes depending on your tastes. To change the flavor, add honey, milk, lemon or combine it with another tea such as peppermint or raspberry. Chamomile tea has been used as a natural remedy for thousands of years. 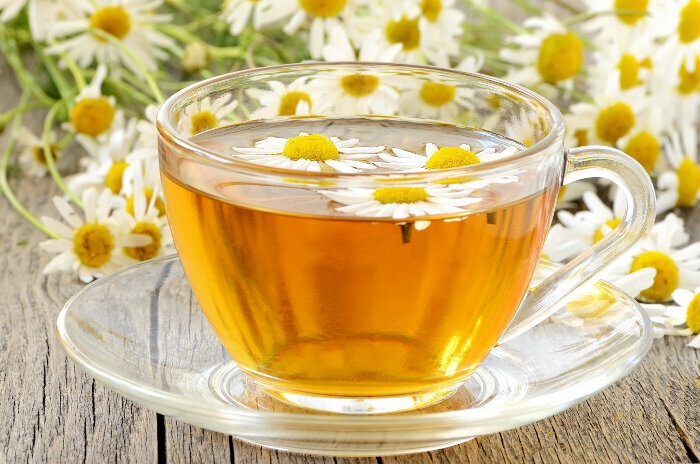 One of the biggest pluses of chamomile tea is that it typically is safe for everyone except those allergic to ragweed and certain pollens. It can be consumed three to four times a day in between meals. Imagine a warm cup of chamomile tea during your morning commute to keep you calm and centered for the work day, but do use caution as chamomile may cause drowsiness. It is useful for adults, children and babies, so it becomes an essential tool in the home-healing cabinet. You may find you use this tea on a regular basis to maintain the health of your family or to ease anxieties surrounding work or school. Many women use chamomile tea to alleviate the discomfort of menstrual cramps. Chamomile relaxes muscle spasms, such as those associated with menstruation. 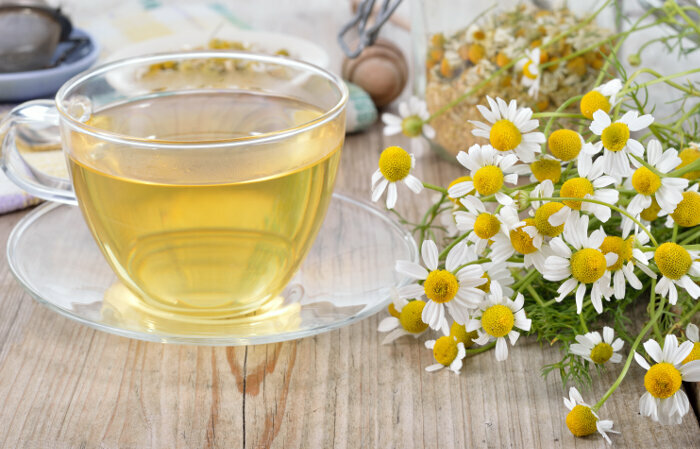 However, chamomile may also act like estrogen in the body, so those taking hormonal supplements need to use caution and check with their doctor before beginning this herbal supplementation. If you cannot finish your entire cup of tea, add an essential oil to it, such as eucalyptus, and breathe in the scent to help clear nasal passages and calm a cough. Do not consume the tea with the essential oil.